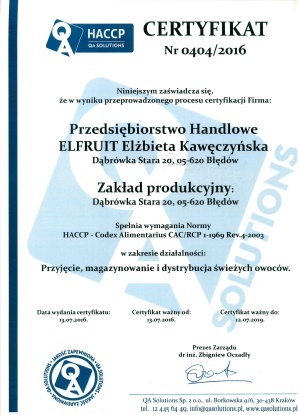 ELFRUIT Trading Company has operated in the market since 2002. 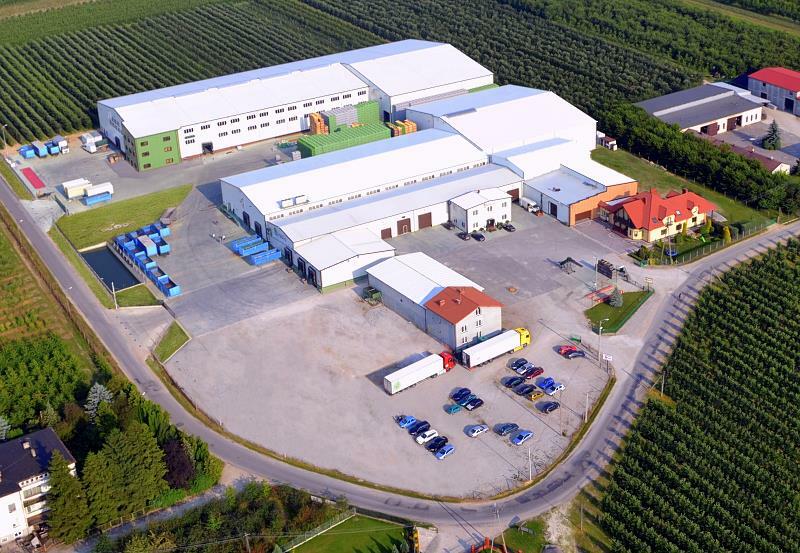 We are a family-run company operating in Grójec county, the biggest fruit farming region both in Poland and Europe, well-known for its fruit farming traditions. We produce and sell fruit and vegetables, as well as supply domestic and foreign customers. The primary goal of our activity is to offer fruit and vegetables of guaranteed high health suitability. Customer satisfaction and recognition, safety of our products, and economic success are the pillars of our company’s constant development and success. Since 2009 ELFRUIT Trading Company has implemented, maintained, and developed Good Manufacturing Practices, as well as food quality and health safety system based on the BRC standards. We carefully choose our suppliers and successively increase their number. Quality and health safety are the main fruit selection criteria. We place a strong emphasis on winning suppliers who possess: Integrated Production, GLOBALGAP, BRC, HACCAP. FRUIT-SAD and TOP-FRUT are two producer groups which originated from our individual in-suppliers, with their surface area amounting to c1000 ha and annual production of 40000 t. Thanks to these groups we have cold store facilities and technologically advanced sorting plants at our disposal. Cooperation with the producer groups ensures products of certified high quality. Products delivered by our suppliers undergo organoleptic inspection, including firmness, taste, caliber, and staining intensity checks. Restrictive control allows us to eliminate fruit with lesions. Products delivered by our suppliers undergo random control for pesticide remains, nitrates, and nitrites. Moreover, we perform regular internal inspections on the farms. We check the manner in which fruit are looked after. Plant protection records are verified, which allows us to determine whether the supplier and fruit farmer performs orchard protection procedures against diseases and pests correctly, and in accordance with the plant protection plan. All our activities are oriented towards attaining customer-required quality level of our products, competitiveness of prices, and promptness of delivery. We offer a full range of fruit varieties. Products offered by ELFRUIT Trading Company are high-quality, healthy, and at an affordable price. extensive storehouse facilities and cooling chambers for ready for sale produce storage. We offer our products in both reusable and disposable packaging. Bags: 1 kg, 1,5 kg, 2 kg, and 3 kg.